Other than Q, Aged is arguably the most upscale restaurant we have this side of Danny Brown and their brunch, while not unreasonably priced, wasn't cheap. You get either a coffee or a juice with your meal, but not both, and no complimentary bloody mary, either. 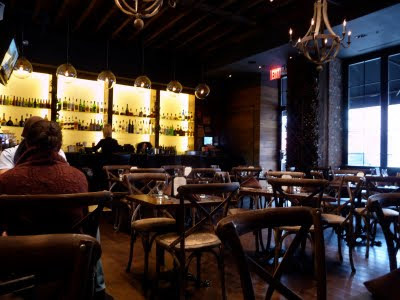 There weren't too many patrons during my meal, but the ones that were there reflected that the management has been quite successful in drawing in those who would be right at home on the Upper East Side. 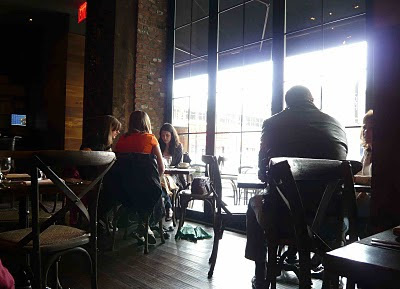 It was raining out this particular late-morning and the interior was dimly lit. In fact, it wasn't bright when I walked in, and they actually dimmed the lights further about halfway through my first cup of coffee. I have no idea why. It was dark on the inside and bleak on the out, and this made me feel as though it was somewhere around 5 in the evening instead of 11:30 in the morning. 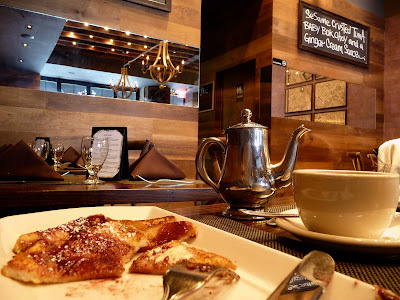 Aged's serves the standard brunch options one would find on any self-respecting brunch menu. French toast, waffles, omelette's, a burger, steak and eggs, pancakes, some wraps, eggs benedict, etc. In other words, it's a real brunch menu. I chose the French Toast with Raspberry. Rather than serve two thick slabs of the egg-batter drenched squishy fried bread, they serve six thin whole-grain ones, laid out simply, without any garnish, on a long plate with a dusting of powdered sugar and a hearty drizzling of raspberry preserve syrup. While the meal itself tasted just fine, unfortunately, by making the toast so thin, the preserves soaked through quite easily and it was overly tart. Good thing they gave me butter. My advice, thicken up that toast. As for the garnish, given that Aged is dying to be seen as a Manhattan establishment that just happens to be in Queens, a half dozen raspberries on my raspberry french toast would have been appreciated. I also ordered a large grapefruit juice and a cup of coffee. One nice touch was that when the cup ranneth dry, I was given a little silver coffee carafe to refill it with at my leisure. Bonus points there. And gone were the cheapo butter packets from my last review. Is it only a brunch thing? 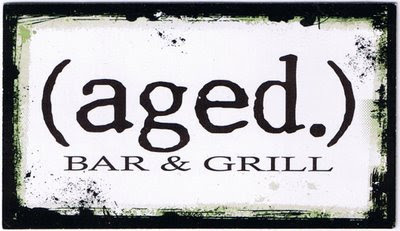 I'm sure that someone out there who's eaten at Aged in the last month or so can leave a comment letting us all know. Regarding the service, I have zero complaints. My waiter was seemed like a very nice guy and was neither AWOL nor routinely bothering me with "how's your meal, sir?" It's nice to be able to read your magazine in peace. So, although the food I ordered certainly had a some room for improvement, it wasn't bad and I can certainly see myself returning to try their other options. The french toast, grapefruit juice, and coffee, with tax and tip came in just shy of $20. I returned for brunch with Bro today. We got there around 11:45 and they were pretty empty, but packed by 12:30. Despite having three waiters, they were overworked and getting their attention required firing flares into the sky. I ordered the Classic Eggs Benedict, with spinach. Not bad, as far as eggs benedict go. I was pleased. The home fries that came with it were pretty good too. No complaints except the price, which was $17. A little steep in my book. Bro ordered the Omelet, but that's code for "three eggs with bacon". He ordered them scrambled, so hardly an omelet. And again, $12 for three eggs? But who in their right mind would order scrambled eggs for $12? I know that many among you have been disappointed in the Aged brunch, but I wonder if that disappointment would die down if the prices did too. Bro had never been there before and he was impressed with the interior. He said that it was nice to have a place that felt like more than a ho-hum diner to eat in. He also liked that as the afternoon got older, the crowd got younger. It's a sign of the change, he noted.